Vancouver, BC, June 18, 2018 - Since Silver One Resources Inc. (TSXV: SVE; OTC Pink: SLVRF; FSE: BRK1 - “Silver One” or the “Company”) began trading in Q3 2016, the management team has focused on advancing the Company by building a strong portfolio of silver rich projects for future growth. Along the way, we have gained a base of loyal investors who recognize the potential of our current silver assets and ongoing strategy. We are proud to say that within this period the Company has accumulated an inventory of silver projects that contain significant exploration upside. Additionally, Silver One is actively evaluating accretive acquisitions with the overall goal of becoming a premier silver company. Silver One started out with three key silver assets located in Mexico which were acquired from First Mining Gold Corp. (formerly First Mining Finance Corp.). With our commitment to build value for our shareholders, we subsequently entered into an Option Agreement with SSR Mining Inc. (formerly Silver Standard Resources) to acquire a 100%-interest in the past-producing Candelaria Silver Mine located in the mining-friendly state of Nevada. Candelaria has since become our flagship project. As a result of these acquisitions, SSR Mining Inc. and First Mining Gold are now two of our largest strategic shareholders. Silver was first discovered at Candelaria in 1864 and from the mid-1800s to the late-1950s it was the highest-grade silver-producer in Nevada, averaging over 1,200 g/T Ag (35 oz/t Ag). The mine was converted to open pit mining in the late 1970s. Early operators included Occidental Minerals and Nerco Minerals. A subsidiary of Kinross Gold subsequently purchased Candelaria in 1994 and produced silver from open pit mining and heap leaching until 1998-99. Kinross closed the mine due to the collapse in silver prices and commenced reclamation of the site. At the time the mine was closed, neither the heaps nor the mine itself were fully exhausted, leaving a large upside for potential future production and the outlining of additional mineralization. The property is estimated to have produced over 68 million ounces of silver. (Historical information was obtained from “Geology of the Candelaria Mining District, Mineral County, Nevada, 1959, Nevada Bureau of Mines, Bulletin 56”, and the SSR Mining Inc. technical report titled “Candelaria Project Technical Report” dated May 24, 2001 (filed on SEDAR June 20, 2002), prepared by Pincock Allen & Holt). SSR Mining acquired the project in 2001 and completed a large drill program on the northern, down-dip margin of the Northern Belle and Mt. Diablo pits. 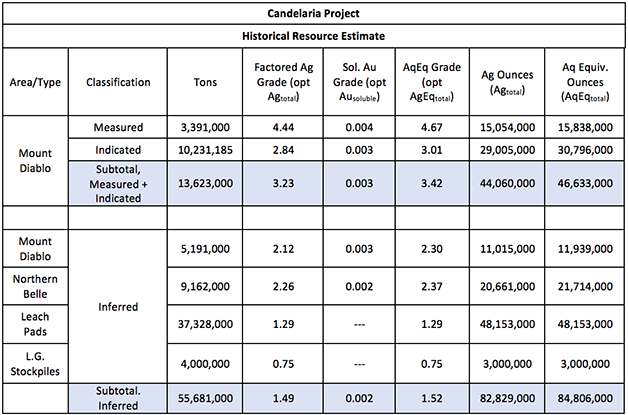 A significant Measured and Indicated National Instrument 43-101 (“NI 43-101”) resource was outlined and is now deemed historical (see Historical Resource Estimate – Candelaria Project, Nevada below). This historical Measured and Indicated estimate amounts to over 44 million ounces of silver. Additional historic Inferred resources of over 82 million ounces silver were also identified, of which 48 million ounces of silver averaging 40 g/T silver remain in the old leach pads. The drilling completed by SSR Mining also intersected multiple high-grade intercepts down-dip from the open-pits, including a drill intercept of 670 g/T over 14 metres being noted. Numerous historic workings that have never been drill-tested, occur along strike to the east and west of the two open-pits. In December 2017, Silver One conducted a 27-hole drill program totalling 1,110 metres on two historic leach pads. As set out in a news release on April 19, 2018, all holes were sampled in their entirety and silver assays from the drill holes ranged from 16 g/t to 111 g/t (43 g/T average). Further, the cyanide soluble silver from the drill holes ranged from 35% to 77% (56% average). The results are very encouraging, considering the heaps were partially leached by Kinross and others during past operations. Our ongoing metallurgical studies will continue for the next few months with periodic results to be released as they are received. The goal is to complete a pre-feasibility study in the coming year potentially enabling us to make a decision to begin initial production on the old heap leach pads with 2020 as the target. Additionally, Silver One plans to evaluate the considerable upside potential that exists outside the area of the historic resource. The drilling completed by SSR Mining encountered multiple high-grade intercepts down-dip from the Mt. Diablo pit, one of the two main pits. This suggests potential down-dip continuity of high-grade silver mineralization which has not been fully tested. Also, multiple old workings located west and east of the pits attest to the continuation of the mineralized system along strike well beyond the area of the old pits. These areas have never been systematically drill-tested. Silver One’s management team believes that continued exploration has a high probability of success and potential to identify additional silver mineralization. Leach pads and low-grade stockpile resources tabulated for entire accumulation of material. Total silver grades factored from soluble silver grades using regression formulas developed by Snowden. Silver equivalent grade includes the contribution from the gold grade (soluble) using an Ag:Au equivalency ratio of 57.8:1. Silver One has also been advancing its Peñasco Quemado project in the state of Sonora, Mexico. The Company was the first to complete property wide geological mapping, soil geochemistry and geophysical surveys that yielded very promising results. Large zinc and lead soil anomalies (values to over 2,000 ppm) occur in two separate areas of the property. The results extended the known mineralized strike by over 2.6 kilometres from the historic resource area where near-surface silver mineralization of just under 10 million ounces of silver has been identified (see Historical Resource Estimate - Peñasco Quemado Project, Mexico below). Additionally, an anomalous area of zinc and lead in soils occurs over an area of 3 kilometres by 5 kilometres in the south-western portion of the property. Silver One plans to drill the Peñasco Quemado targets to test for the potential for a large zinc-lead-silver mineralized system at depth. The data base for the historical resource estimate consisted of 24 reverse circulation holes from a 1981/82 program, 17 reverse circulation holes from a 2006 program and 8 diamond drill holes from a 2006 drill program. Assay data was available for all 49 of the drill holes and 12 trenches. The mineral resource estimate used a kriging estimation method to establish ore zones with a cut-off grade of 30 g/t Ag and assay’s capped at 700 g/t Ag. Resource blocks were estimated by ordinary kriging with samples within a search radius of 25 meters classified as a measured mineral resource, within 47 meters classified as an indicated mineral resource and within 70 meters classified as an inferred mineral resource. As required by NI 43-101, CIM definitions (August 2004) were used to classify mineral resources with the classification of each kriged ore block dependent upon the number of penetrating holes. An in-situ block density of 2.50 t/cu meter was assigned the ore blocks. The qualified person has not done sufficient work to classify the historical estimate as a current mineral resource. Silver One is not treating this historical estimate as current mineral resources. La Frazada silver project in the State of Nayarit, Mexico is an epithermal vein system with Ag-Pb-Zn mineralization that outlined a historical resource estimate of over 4 million ounces silver averaging 250 g/T Ag with Pb-Zn-Cu-Au (see Historical Resource Estimate - La Frazada Project, Mexico - below) and has an excellent exploration upside for the discovery of additional mineralization. The Company conducted a soil geochemical survey over the entire property, the results of which indicate the mineralization is potentially open along strike. The past producing mine is partially developed with kilometres of underground mine workings that expose veins over a length exceeding 3 kilometres and 600 metres along the vertical. This past-producing property has attracted the potential for investment by third-parties. The Company is evaluating the possibilities of optioning the project for further advancement. Silvermex Resources Limited reported in a technical report titled “Technical Report and Preliminary Resource Estimate for the La Frazada Silver Property, El Zopilote Mining District, Nayarit, Mexico” dated November 24, 2008 (amended January 19, 2009) (filed on SEDAR on February 18, 2009), prepared by William J. Lewis, the above historical mineral resource estimate. The historical mineral resource estimate used “measured mineral resource”, “indicated mineral resource” and “inferred mineral resource”, which are categories set out in NI 43-101. Accordingly, the Company considers these historical estimates reliable as well as relevant as it represents a target for exploration work by the Company. The data base for the historical resource estimate consisted of 729 samples; 233 belonging to the La Jabalina West vein, 384 to the La Frazada vein and 112 samples corresponding to the La Jabalina East-Tiro Real vein. The mineral resource estimate used a block model method with a cut-off grade of 80 g/t Ag, 0.75% Pb and 1% Zn. The qualified person has not done sufficient work to classify the historical estimate as a current mineral resource therefore the Company is treating these historical estimates as relevant but not current mineral resources. In addition, Silver One has also been conducting an intense regional exploration program in highly-prospective, underexplored mineralized silver belts in the southwest US. Many of these areas have been generally ignored for decades, as the bulk of exploration efforts throughout Nevada and the southwest US was directed primarily towards gold and base metals. The Company has already identified and staked promising targets which will be announced in future press releases. We have recently returned from conferences and meetings in London, Singapore and New York where we had the opportunity to meet with numerous retail and institutional investors. Overall, the Silver One story was very well-received by the individuals we have spoken to. Although current market conditions remain challenging, there does appear to be an increasingly significant investor interest in silver. Silver One management will continue to build the company to take advantage of an upturn in the precious metals markets. We thank you for your ongoing support as we navigate through the challenges and continue to build upon the strong foundation providing value for the Company and our shareholders.